Crow Canyon Software will once again be a Gold Sponsor of a SharePoint Fest, this time in Seattle August 8 to 11. Crow Canyon will be on the expo hall floor, showcasing its powerful and effective SharePoint and Office 365 applications, on August 10 and 11. Crow Canyon’s applications turn SharePoint and Office 365 into true business delivery platforms, improving operations and increasing productivity for organizations around the world. These applications include IT Help Desk, Customer Service, Employee Services, Asset Management, HR, Facilities, Marketing, Purchasing, and others, as well as custom development projects. 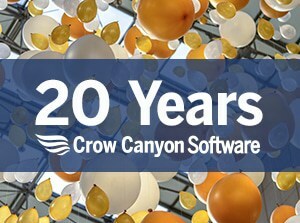 In addition, Crow Canyon will present a 30-minute session on its software, highlighting real-world solutions that were solved by its software. SharePoint Fest Seattle begins on August 8 with two days of pre-conference workshops, followed by a two-day conference with over 90+ sessions. It will be held at the Washington State Convention Center in downtown Seattle. Crow Canyon Software delivers the power of a connected, digital workplace to your organization, turning SharePoint and Office 365 into truly useful and practical tools that solve real business automation problems. Our applications drive productivity and efficiency at your organization, helping you to be more successful and competitive. These applications include IT Help Desk, Asset Management, Customer Service, Employee Services, HR, Facilities, Work Orders, Purchasing, Contract Management, and more, as well as numerous custom SharePoint and Office 365 applications built to meet specific purposes. Over 5,000 customers worldwide, including major financial institutions, government agencies, corporations, military units, colleges, healthcare companies, and beyond, already benefit from these powerful and flexible business applications as well as the custom projects Crow Canyon has done. Visit www.crowcanyon.com to learn about how our business productivity applications for SharePoint and Office 365 can power up your organization.